The Bushka Diaper Bag unfolds into an adorable changing station, where you can have everything at your fingertips. I fell in love with bag because of the organization; I am always digging through my bag trying to find something and that something, always seems to be lost somewhere at the bottom of my bag- with this bag you don't have that problem. 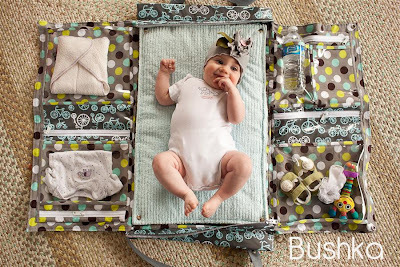 I don't know about you, but my family loves to camp; which is not the easiest thing to do when you have a baby or small toddler. 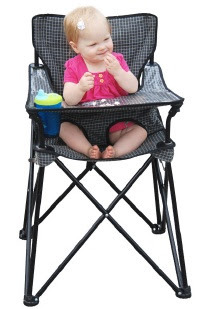 I am always looking for products that would make camping with a baby easier and more enjoyable; and the Ciao Baby Portable Highchair is one of them. I have to admit when I saw this product I had a, "why didn't I think of that" moment. This is a new product and with all the folding camp chairs out there, I am amazed that someone did not think of this sooner. This chair could be used in so many situations: camping, picnics, when you are traveling, or just about anytime when you would be eating somewhere away from home, all you need to do is fold it up and go. The Boon Squirt Baby Food Dispensing Spoon: When I first saw this spoon, my first thought was that it would be great for on-the-go feeding; but once I read all the reviews I realized it was the perfect anytime feeding tool. Have you ever tried to feed a starving baby? You can never seem to get the food from the bowl and into their mouths fast enough; not to mention the mess you make when trying to shovel the food in their mouths that fast. This spoon eliminates all those problems, it makes feeding time easier and more convenient. It has 4.5 out of 5 stars on amazon.